Climate change is caused by factors that include oceanic processes (such as oceanic circulation), variations in solar radiation received by Earth, plate tectonics and volcanic eruptions, and human-induced alterations of the natural world; these latter effects are currently causing global warming, and "climate change" is often used to describe human-specific impacts. Global warming is the rise in the average temperature of Earth's atmosphere and oceans since the late 19th century and its projected continuation. Since the early 20th century, Earth's mean surface temperature has increased by about 0.8 °C (1.4 °F), with about two-thirds of the increase occurring since 1980. Climate change will impact on several areas of importance in the Australian coastal regions. The Australia government have published a report on the risks of climate change. The report presents the findings of the first pass national assessment of the risks of climate change for the whole of Australia's coast. Southward migration of tropical and temperate species. Increased frequency of coral bleaching episodes. Declining kelp forests off eastern Tasmania (Edyvane 2003; Edgar et al. 2005). Increased CO2 absorption by the ocean decreases pH of the ocean and reduces availability of calcium carbonate which may impair the survival of organisms with calcium carbonate shells. Changes to larval transport and upwelling regions and subsequent changes to productivity. Changes in the light supply to the ocean surface with inﬂuence on productivity. Increased storminess Increased turbidity, destruction of marine habitat such as coral reefs during extreme events. Potential loss of mangrove forests and nursery grounds for marine species. What is climate change? modified from http://en.wikipedia.org/wiki/Climate_change, licenced under Wikicommons, Creative Commons Attribution-ShareAlike 3.0 Unported License (“CC BY-SA”). What is Glodal Warming? modified from http://en.wikipedia.org/wiki/Global_warming , licenced under Wikicommons, Creative Commons Attribution-ShareAlike 3.0 Unported License (“CC BY-SA”). 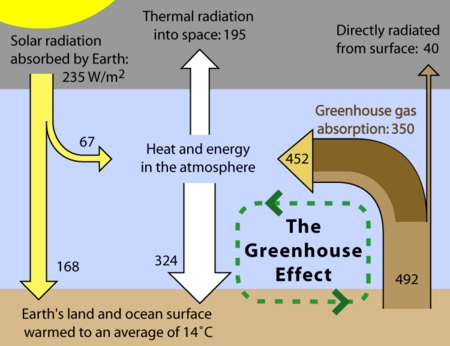 Greenhouse Effect modified from http://en.wikipedia.org/wiki/Greenhouse_effect , licenced under Wikicommons, Creative Commons Attribution-ShareAlike 3.0 Unported License (“CC BY-SA”).